Hydrosmart is an electrically driven magnetic water conditioner that can outperform static magnetic water conditioners. Calcium scale (blockages), magnesium scale and iron scale are efficiently removed by Hydrosmart, as the unit plugs in to a power source, and keeps running for years on end. The unit fits into your existing pipework usually just after your pump. Scale softens and dissolves, while new scale is prevented. Irrigated areas regain their lost productivity as drippers are cleared of scale, along with sprinklers, taps valves and other fittings. The minerals loosened from the pipework actually become available as nutrients for plants. A Hydrosmart electro magnetic water conditioner dramatically improves the viability of plant growth, in situations where salinity is an ongoing issue. Tests conducted by scientists show that plants tolerate much higher salinities when the unit is fitted and turned on, than without. This includes garden vegetables as well as crops and grass. 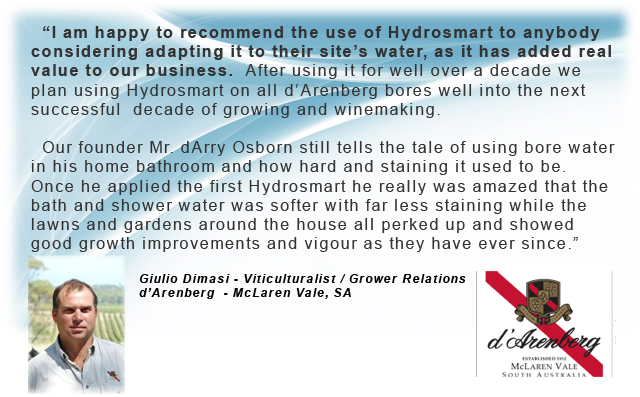 Numerous testimonials, and a constant stream of positive customer feedback to Hydrosmart, demonstrate the health and vigour that is re-established in gardens after installation of the unit. Minerals in the water are made active in the soil through this treatment. Soil structure changes, and allows water to penetrate the roots of plants, bringing them into bloom. Hydrosmart has improved homes from coast to coast, and internationally. Lime streaks, hard water and blockages are banished, as the Hydrosmart frequency treatment emits electro-magnetic pulses into water, dissolving the minerals it contains, and having positive downstream effects on built up problems. Water also lathers better, and produces soap suds after treatment has been applied. Better surfactant activity gets items cleaner in the home, such as shower screens, sinks, cutlery crockery, and glassware. Clothing comes up cleaner and softer as dirt particles are dissolved away by activated minerals present in the treated water. Our live in staff like using the water now, as the shower water feels softer and using much less soap and shampoo. Happy water, happy hotel, happy customers, come to Blinman! Lower scale issues with our water heaters. 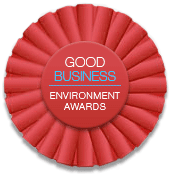 Water is softer for use in showers and washing of clothes etc and the pipes and surfaces are better off than before.